Home and small office networks have grown immensely in the past few years. Whether the need was efficient data transfer or LAN parties, consumers have turned to networking as their solution. Thus, when the first wireless networking hardware was made available to the public, many jumped at the chance to purchase it. However, many soon realized that while wireless networking may have saved the hassle of cords, it presented several problems. First were slow transfer speeds. While wired networking provided a constant 100mbps download rate, wireless networking allowed less than half of that. Second was security. At home, it was the infamous "drive up and log on" tactic of laptop owners and the fear that neighbours would be able to access your router. But in the business world, wireless networking presented much more serious problems. The holes in security were only waiting to be exploited by experienced hackers, unauthorized personnel, or lowly competitors. Those were many of the fears and complaints that accompanied the first wave of wireless networking. However, wireless networking has since outgrown these early issues, evolving 802.11g and WEP encoding, which constitute to both higher transfer speeds and tighter security. 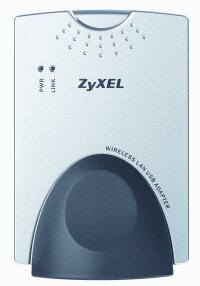 Today we will be looking at one essential component of a wireless network: the adapter. We will be focusing on ZyXEL’s ZyAIR G-200 USB adapter. As a point of comparison, we will be weighing it against Netgear’s own USB adapter of the same calibre, the Netgear WG121, so do not be surprised if we reference the WG121 throughout this review.